One of the ways that you can measure your success as a direct sales consultant is to see how often you can “sell” your direct sales business, not only during a direct sales party but during mundane, day-to-day tasks like paying your bills and visiting the local grocery store. While it’s easy to make sales and generate direct sales leads when you’ve got a captive, RSVP’ed audience staring up at you just waiting for you to make your pitch, it’s another thing entirely when you’re standing in line next to a frazzled mom counting coupons at the check-out counter. However, once you’ve learned to share your story to just about anyone, just about anywhere, you’ve made leaps and bounds towards making your direct sales business an entire direct sales career. In the world of a direct sales consultant, one of the most powerful tools you can carry around with you is known as your elevator speech. This is a simple yet powerful message that you can share in about the space of time it takes to make a quick trip in the elevator. It is important because many times you’ll meet hot prospects in less than ideal locations and if you don’t seize the opportunity, it will pass you by. You can look online for examples of successful elevator speeches, but it’s important that you customize yours so that it really captures who you are and what you do. Next, practice saying it in front of the mirror, with a timer until you’ve got it down to under a minute and a half and free of any “ums” or stutters. Once you’ve aced your elevator speech, the next order of business is making sure that you’re armed with a great business card. This should involve more than just a name and phone number, and should instead capture the attention and imagination of those you give it to. Many times you can include a few tips or ideas on the back, or a great quote or question that really grabs the reader’s interest and won’t let go until they call, email or visit your website for more information. Add the delivery of your business card into the broadcast of your elevator speech for extra impact. Anyone can be a potential lead, if you know how to turn ordinary opportunities into extraordinary business situations. That frazzled mom who kept her head together in line might make a great host for your next direct sales party, but you’ll never know if you don’t ask! Marketing Your Direct Sales Business! There really are an unlimited amount of FREE leads out there, you just need to be willing to go to any lengths to get them. When you take advantage of every direct sales lead opportunity you will always have a full calendar and have a consistent income from home. Working from home can be great fun. Though there are frustrating aspects of being self-employed, it is worth it in the end. You will feel great every time you look at what you’ve accomplished and remind yourself that you did it. Make sure that you are taking advantage of the direct selling home office deductions as they are there for you when you are working from home. The truth is that there are advantages of working from home from a tax point of view, advantages that will make you reconsider the frustrations you sometimes feel, and will make them more acceptable. One of the main advantages from a tax point of view is the ability you will have to write many items off. If you have designated one room in your house as the office, you will be able to write off the space and any utilities you pay as a result of conducting business there. You can also write off the items you have purchased for your business such as a new computer, printer and other hardware. Other items include: a desk, a chair, office supplies and anything else that goes directly toward your business. The home office deduction is definitely one of the perks of being self-employed and working from home. Your direct sales business is creating income and so is the income tax reduction you take when you take advantage of the home office deduction. Your direct selling income tax deductions are legitimate work at home deductions that the IRS put there for you! 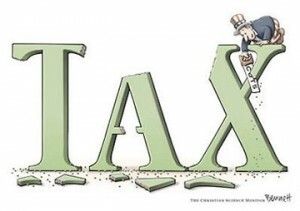 While you will be responsible for paying your own taxes, you will have more control over them. You can determine what space in your home will be designated strictly for work and as long as it’s used for work and work alone, it will be considered business space. You will also be able to keep track of what you owe because it will all be right there at hand in one spot at home. This is another perk of being self-employed from home; everything stays right there with you. This means you don’t have to go searching for item receipts when tax time rolls around. Using a simple system of filing your receipts keeps life simple and generates income for you at tax time by reducing your income tax liability. There are many advantages to becoming self-employed. Tax time doesn’t have to be scary nor does it need to be intimidating. Just keep all relevant information close at hand and learn what you can and can’t write off. This will save you money in the long run while helping your business to further succeed. Learn more about direct selling income tax deductions for home based business owners and save more money on your taxes! Home Party Sales Down? Get Some Training! So many sales consultants think that they do not have to go to training meetings. Meetings are the key to party plan success. Direct sales training is necessary for anyone wishing to work in the home party business. Companies who want their independent sales consultants to be successful typically offer their consultants ongoing opportunities to learn and thrive. Product knowledge, lead generation, and effective promotional methods need to be a part of home party consultants’ training. Each of these areas will be discussed in detail below. Consultants Know Your Direct Sales Products! To begin, home party consultants need to be vigorously educated about the products that they will be selling. Having an elaborate party with food is fruitless if a salesperson is not very knowledgeable about his or her products. Those attending the parties are sure to have detailed questions about products as well as return policies, discounts, etc. To this end, the company employing independent consultants typically provides product training in the form of DVD manuals and online sessions. Find Direct Selling Leads – Get Bookings! Next, lead generation is a very critical part of the training for direct selling party consultants. The parties will cease to go on without ongoing bookings. Salespeople are provided with techniques to help them get more people at their shows and to grow their mailing lists. There is an unlimited supply of business out there and you just need to know where to look and how to find party plan bookings! To provide an example of this, salespeople could be encouraged to hand out surveys at the end of their parties which ask attendees if they would like to be part of a mailing list. These repeat customers should be marketed to and encouraged to bring people to future parties. They should also be given incentives to host parties of their own. Last but not least, party consultants should be trained in effectively using different promotional methods to market their product parties. For example, the companies that provide the products usually offer their consultants the use of websites either for free or for a small fee each month. These websites contain a lot of useful features, including the sending out of automatic emails with hyperlinks to the sites, which aid in promoting the consultants’ parties and products. It is imperative that you attend your party plan company team training meetings. One of the biggest mistakes that most direct sellers make is not going to their team meetings. In conclusion, it is critical for home party consultants to receive direct sales training. The training typically involves discussions on product knowledge, lead generation, and effective promotional methods. When you learn the proven systems that those that came before you have used you will get the same results. Learn more direct sales and party plan specific training and motivation at the number one free direct selling training center on the web. Deb Bixler provides proven systems that work for direct sellers and they will work for you. There is one thing that any direct salesperson needs in order to grow her business… leads! Without leads, you have no potential customers and no one to sell your products to. This, of course, translates directly into no profit and pretty soon, no business. Generating leads can seem a daunting task. No one wants to spend hours on the phone cold calling. But not to worry. Cold calling has been proven ineffective most of the time, anyway. Because you don’t really know the person you’re trying to sell to when cold calling, you can’t possibly expect to know her needs, wants, or interests. It’s even unlikely that potential customers you call won’t stay on the phone long enough to get to know you or your product well enough to become interested in it. There has to be a better way to generate leads for your direct sales business. The good news is– there is! When you first start out in direct sales, chances are good that your leads will be people you know and who you see or talk to on a regular basis. Typically, these will be your family and friends. The chances are good that your family and friends will be happy to buy a few products from you when you first start out because they want to support you in your new business endeavor. Your excitement about your new business will also rub off on them and they’ll be excited for you, too. But you can’t expect your family and friends to be your sole support throughout the course of your business. Sooner, rather than later, you need to generate leads elsewhere. Thankfully, there are many ways to do so. The most obvious place to generate leads for your direct sales business is at home parties. Here, not only will you find a roomful of people who are already interested in your products, but you can ask these customers for the names and numbers of people they know who might also be interested in your products. Offering an incentive to current customers to entice them to hand over a list of contacts is a great way to get them involved! Ask each guest at each of your parties for a list of at least five prospect names. Offer a special product to the guest who provides you with the longest list of names. If you still find you can’t get prospect names, hand out your business card to everyone at the party and encourage them to pass your name and number on to friends and family. You can still offer discounted products or incentives to those who refer someone to you. Just have the referral mention the name of the one who sent her to you. Another great way to generate leads for your direct sales business is to team up with a retailer who reaches a similar market but who is not a direct competitor. For instance, if you sell makeup, try finding a clothing retailer or a hair salon that will let you set up a display in a corner of her store. Include sample products, catalogues, and information about you and your business. Offer a drawing for potential customers to enter and take a chance on winning a free gift. On each ballot have entrants write down their names and phone numbers. People understand you’ll need this information to notify them if they win the prize. And you’ll have a full list of new, potential customers. The key to generating leads for your direct sales business is to think creatively. Contact everyone you know, offer incentives and products to people for referring possible leads, and get the word out about your business. you’ll soon discover leads all around you. At that point, it’s up to you to identify them and contact them with your product information. No matter what type direct sales business you’re involved with, a big part of your job is probably using the telephone. Unfortunately, lots of people have a fear of making sales calls. You might find it easy to talk to a customer when they call you. But the mere thought of having to pick up the telephone and call someone to make an appointment or try to sell them something, gets your stomach churning, dries out your mouth and empties your mind of everything you know. Does this sound familiar? You have two choices. Let your fear of the phone beat you. (Then you might as well quit your job.) OR face your fear, pick up the phone and call someone! Let’s break the fear down into manageable steps and talk about how to banish phone fear from your life forever. First, look at your work environment. When working in direct sales, you’re the boss. Most direct sales consultants work from home. But you still have to transform your work space into a proper working environment so that it’s more conducive to actual work. Doing so will put you in the right frame of mind to work–mentally. Some direct sales reps put on “business clothes” so they feel more like they’re working, but you don’t have to go that far, unless you want to. Ideally, a headset with an attached microphone will let you talk with your customers while typing or writing, if you choose. And you won’t get a sore hand from holding the phone for what may be a few hours. But a regular telephone will work, too. Have pen and paper, product information, objection handling answers, and even sample products within easy reach so you don’t have to go looking for things while you’re on the phone. Make sure you have a bottle of water to stop your mouth drying out. There’s nothing worse when you’re trying to talk! And now that your office is set up, there’s no longer an excuse to avoid making those calls. So, what’s your real fear? Possibly the fear of rejection? That’s normal because you will get rejected. But that doesn’t matter. Sales is a numbers game. Set yourself up to make a certain number of calls, or to make calls for a specific amount of time. Then don’t stop. Every rejection makes it more likely that the next call won’t be a rejection. And rejections aren’t personal! You might have called at a bad time. Your customer might already have what you’re selling, or she may simply not be interested. There are a host of reasons for getting a rejection over the phone. None of them should make you more afraid! don’t be afraid of objections, either. If a customer is asking questions or starting sentences with the word “but,” this is a positive sign that they’re showing interest in what you have to offer. Explain the benefits of your product. It could make them smarter, stronger, help them cook better meals, smell better, take years off their life, save them money, etc. People want to know if what you’re selling can help make their life easier. The worst that can happen is that they say “no” to you. No big deal. Move on to the next call. Separating your business psyche from your personal psyche is a skill that’s hard to master, but that can be learned through experience. Before you pick up the phone, determine to have confidence in yourself. You have great products and you’re calling to help your customer. She just doesn’t know it yet. Be positive, and smile every time you dial. Draw a little smiling face and attach it to, or near, your phone. If you’re smiling, it really does come through in your voice and people will be more likely to want to speak with you. You can overcome your fear of the telephone. Just never give up. No matter what. There are two ways to look at direct sales. The first is to make a sale and then start looking for the next one. If this is what you’re currently doing in your direct sales business, then you’re missing out on a lot of potential sales that require less effort than it took to make the first sale to someone! The second, smarter way to look at sales is to not think of it as a sale. Think of it as gaining a new customer for life. If you use this approach and the following techniques, you’ll attract more repeat business and referrals than you would have thought possible. To explain this better, think of your local supermarket. Generally, people go to the same place to buy their food all the time. There are a few reasons they do that such as convenience, knowing the products, knowing the prices, getting to know the staff, getting the quality they want, etc. People return to the same store because they know the store and feel comfortable there. In a direct sales business, you of course, want to have as many customers as possible. It’s much easier to sell to the same customers over and over than it is to keep on trying to find new ones. To build a successful business you need to do both. Here are some great tips for turning sales into repeat customers. • Remember birthdays and other special occasions and send an email or a card, or make a quick phone call with good wishes. • Learn more about your customers and recommend their services to other customers if needed. For example, if you have a customer complaining of a toothache and you have another customer who is a dentist, pass that information on. • Respect your customers and don’t take them for granted. If there’s a problem with a purchase, don’t try to ignore it. Go the extra mile and try to solve the issue to your customer’s satisfaction. • Set up regular communication with your customers by creating a newsletter and emailing it to your customers on a regular basis. The content can include new product information, local events, humorous anecdotes, contests and tips on using your products. Offer customers the opportunity to contribute to the newsletter as well. • Offer specials. Have a “buy two items and get something free” promotion. Or make up simple coupons and hand them out with your current catalog. • Always ask for referrals at every demonstration and when making every sale. • Offer current customers an incentive if they give you five referrals. • If a lot of your customers live locally, run social functions such as a home party at your own house, or an Open House event. • If you don’t have a website or a blog that you use to promote your business, you really need to think about getting one set up as quickly as possible. An online presence gives you a lot more credibility in this Internet age. Your customers can access information on your site any time they need to, instead of calling you or sending you an email and waiting for a reply. You need to be able to provide them with the information they need when they need it or you may risk losing them as a customer. • Use your website to offer tips on how to use your products. This way you’re simply offering information and it’s up to the customer to make their own decision about purchasing an item. • Have a question and answer blog, or a discussion forum as part of your site. This allows your customers to get more information without having to contact you directly. And it helps educate them on your products without creating the impression that you’re a pushy salesperson. • Offer as many different payment methods as possible. • Be honest and keep your promises to customers. • Deliver on your promises 100 percent of the time. It’s cheaper to keep a customer than to try and get a new one, so if you keep open lines of communication and interest your customers, they’ll have no reason to go elsewhere for the direct sales products you offer. Growing your direct sales business locally can be a challenge if you’re afraid of approaching people. It’s hard for some of us to “cold call” and it’s even harder for us to walk up to someone and start talking about our business. When you take the time to creatively advertise your business, though, you’ll find it’s not that hard to talk to people. You just need to have fun and not consider it working. Try these ideas and see if you don’t have more fun marketing your business this way. Creating sample packs and giving them away is a great way to put your business out there in front of people. Include a sample of your own and ask other consultants and business owners to provide samples to include. Be sure to add your contact information on your sample so they know where to purchase the product. Include a brightly colored flyer or brochure. When you use a bright color like yellow or florescent green, your flyer will stand out and attract attention. Kids love balloons and they’re inexpensive. In the summer, kids are often outside playing. They love to go to the park and other places. Tie your business card to the string on a balloon and give the balloons to kids you meet. Ask them to the cards to their moms or dads and keep the balloons. Give these away while walking through the park, at the mall or a shopping center, or at a daycare. Put magnets on your car while you’re parked at the grocery store, mall, or work. Put a note on your car giving people permission to take a magnet. Put a balloon on the back of your car so you draw attention. Be sure people have easy access. Create flyers for your contest and hand them out. Set a date for the contest and on that date draw a winner. Have people sign up for your newsletter list, send you an email, or call you so you’ll know who wants to have their name entered in the drawing. Create a small goodie bag and take them to your local daycare center. Include a pencil, notepad, small toy for a child, and your business card. Call the daycare center and explain what you want to do. Ask them how many children they have so you’re able to make enough for everyone. Create a business card size calendar from an online store and hand them out. People like calendars that they can place on a refrigerator or file cabinet. You might also consider a full size calendar that can be hung on the wall or a purse size calendar. Consider your options and go with what fits your budget. Create a packet that you can give to new renters in your apartment building or home owners who are moving into your neighborhood. You can use these with homes that are for sale. As long as they don’t have a “do not solicit” sign on the door, you can place this bag on the door handle. Owning your own direct sales business is a great way to earn extra money or to pay the bills each month. When you use creative ways to advertise your business, you’ll feel like working it more because it won’t be a chore or even a challenge. Brainstorm ideas you can use and write them down so you’ll remember them later on. Then note which ones work and which ones don’t so you aren’t wasting time on the latter and you’re on your way to building a profitable direct sales business. Whether you’ve just started in your direct sales business or have been in direct sales for years, it’s important to take certain steps to be successful. What influences your success? Many factors contribute to the success you have in direct sales but it ultimately comes down to you and your motivation. The first steps to success in direct sales are choosing a business you’re passionate about. Ever talk to someone passionate about her business? The enthusiasm spills over to anyone she’s talking to. The same should be true of you and your business. When you love what you do, you’re good at it, and you will be successful. Select your niche. Find a need to be filled or a problem to solve in your target area. Selecting your niche market means you choose a business that is not already in a saturated market. Don’t signup to be a makeup rep when there are already 25 in your area. Instead, choose to sell home decor because there are only a couple of consultants in your community. Choose a profitable business. In direct sales you want to earn a high commission. So selecting a company that pays 50 percent is much more attractive than one that only pays 20 percent. A larger commission allows you greater flexibility when offering personal discounts and special offers. Larger commissions also offer greater profits on sales made. Know your business. Successful business owners know their businesses and their competition’s business. Read over your welcome kit information and business materials. Attend any training sessions, online classes, or webinars the company provides. Most, if not all, direct sales companies provide training at no extra charge for their sales force. If you’re successful at selling their products, you bring them new and repeat customers, which mean larger profits and more successful products for them. Create a business plan. A business plan is an asset for any serious business professional as it provides clear objectives, mission, company philosophy and more importantly where you see your business going and how you’ll do it. A successful business plan is a road map to your victory. Be flexible. Flexibility is just as important in business as it is in any other aspect of life. A business that isn’t able to re-form itself to changes in circumstances, market or philosophy will soon find the need to become a new business. Have dependable sources of cash flow. You’ve heard that most businesses fail within the first year of business. One of the reasons is not enough cash flow. Determine how much it will cost you to run your business before and after launch, along with your sales forecast and budget. Your projected expenses should include the daily and unexpected incidental costs of doing business. After you’ve started your business you can determine a more accurate picture of your real life expenses and adjust your estimates as needed. Stick to your budget. Create a budget and stick to it, especially during your startup. Determine how much you need to run your business, including advertising costs, website hosting, etc., and determine how you’ll fund it. Reach your customers. How will you reach your customers? It’s no use in having a product if no one knows about it and how to buy it. What are your marketing and networking plans and how will you implement them? Use the technology that’s available to you but don’t overreach. It’s okay to start small, but have a plan for success. Remember that after you’ve reached your customer you need to keep them coming back. Creating a streamlined system that connects with your customers and keeps them returning will create a smoother business operation. Choose your sales force. Why do you need a sales force? A sales force will help you become more profitable. The more venues you have for getting your products into the hands of customers, the more profitable you’ll be. Recruit a quality sales force that is as passionate about the business as you’re! Implementing these simple steps will move you well on your way in your goal to build a successful direct sales business. Find your passion, create a plan for your success, and allow for flexibility in your business… and you will succeed!